We’re excited to announce the #1 requested workshop! With our new location open at 800 Erskine Ave, we’re happy to have a dedicated accessible workshop area available to guests. You will have full access to our staff expertise, all four lines of paint: Fusion Mineral Paint, Country Chic Paint, FAT Paint, and Wise Owl, as well as any choice of brush to complete the project. 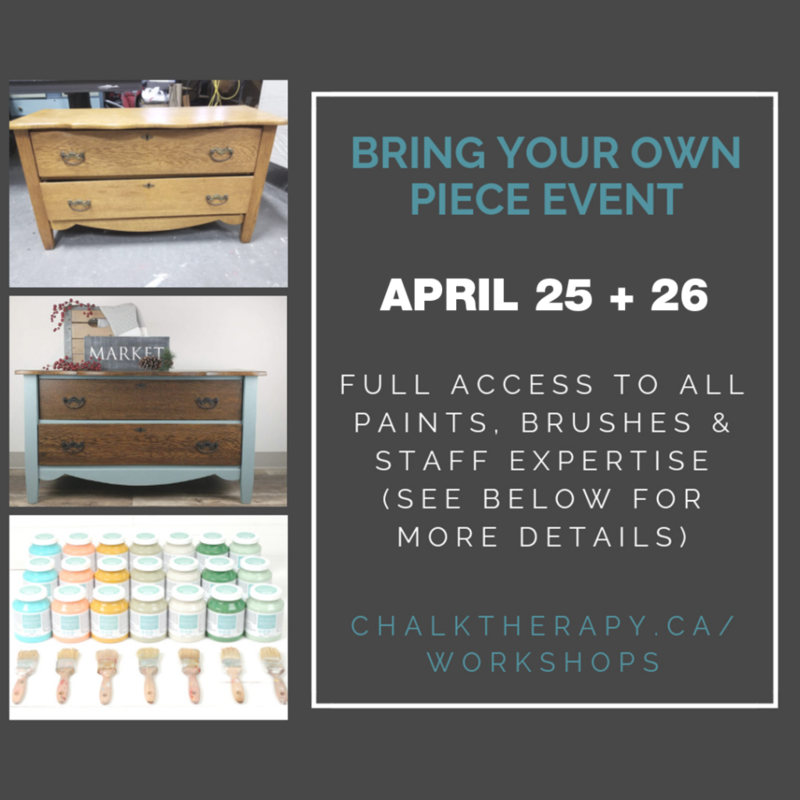 You can drop your piece off the day before, or the morning of the workshop. The workshop will begin at 1pm on the first day, where we will start by assessing each piece, cleaning/prep, and then choosing colours. We discuss all products and techniques required for the look you’d like to achieve, so feel free to bring in photo inspiration! We will remove all original hardware if applicable, spray the first day, and have it ready to put back on to finish the piece. You may also choose new hardware from the gallery at an additional cost. You will then return the following day at any time of your choosing before 1pm to allow dry time between products and finalize your piece! You’ll be able to take it home by the end of the second day session. IOD transfers will be available for additional purchase, and we will assist you throughout the application. April 25: 1pm-4pm / April 26: Start time is anytime between 10am-1pm. Typically ends by 4pm. End time depends on the project, what time you arrive on the second day, and how you paint! Spaces are limited with only 6 spots available.